Very cool product! Would have loved it, but it wasn’t wide enough to work in my project so had to return it. I would have given it 5 stars but the box arrived open on my porch. Not sure who is to blame for that. Dimensions 1.0 In. X 33.5 In. X 72.0 In. We absolutely love the design. Very well made for the price. I renovated a small bathroom in my apartment and installed this shower door. This was a great choice - the clear door opened up the entire bathroom and the folding glass opens into the shower and allows you to enter/exit easily and the door isn't accidentally bumping into anything. Bought this after getting estimates for a custom shower door *** for our shower which could not accommodate a frameless single glass door in a narrow space. This door was delivered without any problems and we installed it ourselves (with no experience). After carefully reading and following of the instructions, it took us a few hours. Looks and works great. Very thick glass and seems to be very high quality. My only criticism is that you need to grab the middle/edge of the glass to get the door to fold while opening once you are in the shower. Pulling the knob only doesn't make the heavy door fold inward but it's a very minor complaint. The installed door actually looks better than the mfr photo. Fitted our 34” W shower perfectly. Works great. These are so hard to come by as our shower door opening was smaller than a normal shower door opening. Definitely recommend. We have been shopping around for our shower doors. The size of this glass shower door is perfect. The installation was easy. My contractor did not have any issue. The folding door design makes entering and exiting the shower easy. I recently remodeled a 1950 shower with pink ceramic tile...just couldn't look at that color anymore! It originally had a simple shower curtain, and when I started investigating the possibility of putting in a glass door, I realized why! There really wasn't enough room in the small WC area to put a single door that opened fully. The DreamLine bi-fold door was the answer! It opens beautifully without taking up a lot of space or bumping into other things (like the toilet!) in the WC. If you are a DIYer like me, you'll still want to get it installed by a professional unless you've had experience hanging doors like this. That's the only reason I didn't give this 5 stars. This is a great solution for a narrow bathroom. 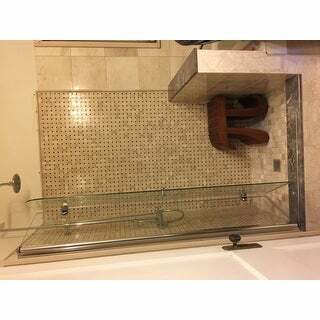 The folding glass allows you to enter and exit the shower with ease....easy to assemble and install. From start to finish about an hour. best with 2 people! Choosing and istalling this clear door opened up my entire bathroom look. We did not install the track bottom so we use it like a swing open door instead. This door operates and cleans up great. This product has truly brought my bathroom makeover to a whole new open room feel and elegant level. I love this compact shower door. The installation was easy. I am glad to find a bi-fold door at this width, a full door at the same width would have hit my commode and surely broken with an unsuspecting guest. Thanks for the option. I just wish it came in other finishes. Perfect in our small bathroom. I thought it was a bit expensive but my half bath is very small and this folding feature was perfect because the toilet was close to the old door so if you opened it to far, it would hit the door. Anyway, all the glass scares me and it still leaves a gap so water manages to come out. If it wasn't for that I'd give it 4 stars. It came on time with no problem. We didn't open it yet. We bought it for our guest bathroom and waiting for finishing to install. I will post a photo when it's ready. Not too many would attempt to install a glass shower door. This door was easy to install!! Nice upgrade for our bathroom. Measure 3 times and don't be afraid to do it yourself. It saved me hundreds of dollars. Beautiful finishing touch to new bathroom renovation. "how wide is the hinge strip that mounts on the wall?" The hinge assembly is approx. 3-1/2" wide. "I need to know the minimum and maximum width for the unit?" The aqua fold width, when in the closed position is 33.5 inches wide, When the panels are folded, it folds down to about 10 inches wide. "The wall on the hinge side of the shower door is approximately three-quarter inches off of plum. The shower pan itself is perfectly level. Can I make this door work In this situation?" This only offers 3/8 inches of adjustment for out of plumb walls. With out of plumb conditions os 3/4 inches, it will not work, unfortunately. "Can the shower door open outward instead of inward"
The complete door floats from the frame on the wall allowing it to rotate in any direction yet the the door can only fold in half in one direction, which you could choose during installation. After it’s folded I’m half it can swing in or out. The metal looking floor piece is simply a bar, not any sort of track. It’s just there to catch the plastic insert on bottom when showering to avoid water from going everywhere. I suggest buying a longer plastic piece than the one provided. It’s not tall enough to actually catch the floor bar so it’s kind of pointless. I'm sorry but the Aqua Fold only folds in. Once folded in it can pivot out. Thank you so much for your interest in DreamLine and for shopping Overstock. "COULD I HAVE DOOR HINGED ON THE RIGHT SIDE OPPOSITE WHAT IS SHOWN IN PHOTO OF DOOR"
Yes, this shower door is reversible for right or left side opening. "Is this door available for a bath tub; perhaps 60" tall?" "Does this come in brushed nickel?" It is only available in chrome at this time.